The testimony from the new Fed Chief Powell empowered USD and today the flash CPI data from Eurozone and the advance GDP data from the US may put this pair on pressure. 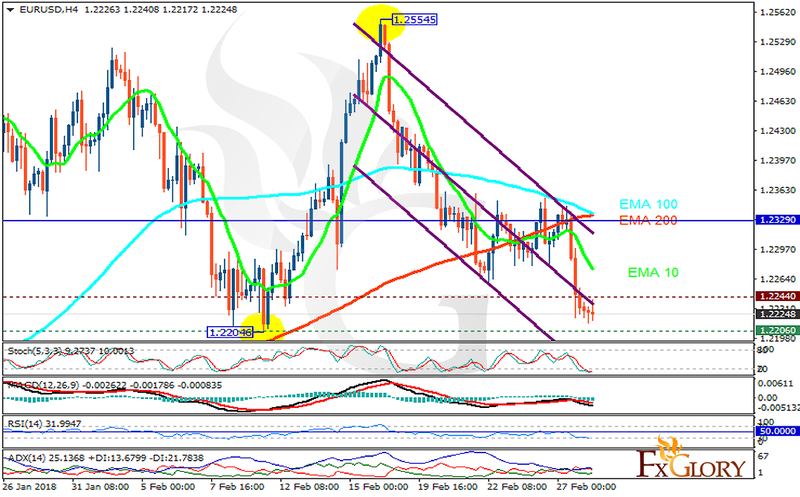 The support rests at 1.22060 with resistance at 1.22440 which both lines are below the weekly pivot point at 1.23290. The EMA of 10 is moving with bearish bias in the descendant channel and it is below the EMA of 200 and the EMA of 100. The RSI is moving in oversold area, the Stochastic is moving in low ranges and the MACD line is below the signal line in the negative territory. The ADX is showing sell signal. Short positions are recommended towards 0.21.